One year was all Asap Rocky needed to get his name highlighted in the hip hop genre and earned a nomination in the BBC Sound of Poll 2012. The artist’s popularity has been on the rise since the time of his inception. His music videos for songs like Peso, Get High and Purple Swag, among others have gone viral since the time of release and have made him the most hyped up rapper on the web. Asap Rocky tickets will give you a chance to listen to the latest hip hop hits live! Sorry, No tickets available for "Asap Rocky". Asap Rocky passion for music made him experiment with rhythms and beats at the age of eight. His inspiration wasn’t just the well known musicians but also the everyday events and surroundings that played a major role in his life. Rocky was born in a crime infested neighborhood and witnessed the tragedy of his father being jailed at the age of 12. This wasn’t the end of tragedies, shortly after this, his brother was killed in front of his eyes. At this point in time, Rocky and his mother were left alone to battle the challenges put forth by life and were forced to adopt a nomadic lifestyle. The changing places gave him an opportunity to meet different people and know their life story. This was an interesting experience for the artist and inspired him to take up rapping seriously. The destination that brought him luck for his professional career was New Jersey. The first step taken by Asap Rocky to enter the world of music formally was to assemble a crew of creative minds. He named it ‘ASAP Mob’ and finalized the list of rappers, video directors and producers. This set up coupled with the talent of the artist made him an attractive deal for the major recording companies. The artist exposed his musical abilities by uploading a video on the internet that got viral within days. ‘Peso’ within weeks was ranked among the High Profile 97 songs and received a great airplay. This was one major achievement for the artist within a short span of time. Following this, Sony, RCA Records signed a $3million contract with ASAP Rocky and the work on his first studio album begun. Meanwhile he also released his first mixtape LiveLove A$AP that have received positive reviews from critics around the world. ASAP Rocky is appreciated for his smooth and breezy style of rapping. Since he has travelled to different places during his childhood, different lifestyles reflect in his music. Houston plays a special role in this regard. 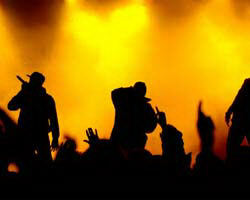 Other than this, his influences include Mobb Deep, UGK, Bone Thugs-n- Harmony, Three 6 Mafia and others. The artist has not just been focusing on his albums and mixtapes but has also been conducting concerts alongside as well. He recently made an appearance in Drake’s Club Paradise Tour accompanying Kendrick Lamar. Now, it is time for ASAP Rocky to conduct a concert where no one else will be sharing the stage with him. The artist’s music has done a great job in building up a great fan following and he is expecting a good audience turn out in his upcoming live performance. Listening to ASAP Rocky will take you on a tour through his personal life and will acquaint you with his memorable, pleasant and harsh experiences. The sound that just got nominated for the BBC Sound of 2012 is going live this year! Are you one of those crazy fans that contributed in making the artist’s videos go viral over the internet? Your star is performing live with all those hits you liked and shared! So without wasting any other moment, get off your seats and buy ASAP Rocky tickets as early as you can! The discount offer has been activated already. Grab the chance to enjoy good music at good rates right now! Q:Can I buy asap rocky tour tickets directly from the venue? A:Yes, you can buy Asap Rocky Tickets directly from the venue if that is convenient for you.